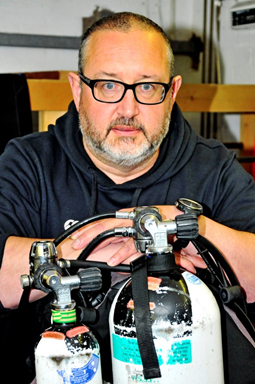 Martin Sayer is head of the West Scotland Centre for Diving and Hyperbaric Medicine and the UK National Facility for Scientific Diving, both presently hosted by the Scottish Association for Marine Science located near Oban, in Scotland. He graduated from the University of Wales (Bangor) in zoology with marine zoology and his doctoral thesis was in animal (fish) physiology. During a brief post-doctoral fellowship, Martin continued research into fish physiology while lecturing in animal and human physiology. He moved to Scotland in 1991 to work at government marine research laboratories near Oban and joined both the diving and hyperbaric teams; he took over as head of both units in 1998. Martin has published over 100 scientific papers, articles and book chapters. Martin was elected a Fellow of the Society for Underwater Technology in 2002 and awarded the Inland/Inshore Diving Contractors Science Award in 2006, the Houlder Cup for excellence in diving operations in 2008 and the BSAC Colin McLeod Award in 2012 for furthering international co-operation in diving. Martin started diving at school for a project that eventually resulted in him winning the European Young Scientist of the Year award in 1979. He has over 5,000 logged dives and has led numerous scientific expeditions to both Polar Regions and to locations in all the oceans of the world. Martin sits on numerous diving and underwater science committees in the UK and in Europe; among these he was chair of the European Scientific Diving Panel from 2012-16 and is currently a member of the UK HSE’s Diving Industry Committee. Martin took over the editorship of the journal Underwater Technology in 2007; he is also an Editorial Board member for the journal Diving and Hyperbaric Medicine.